Need an added bonus reason to try this vegan skillet cornbread recipe? This version is completely refined sugar-free, with maple syrup for a natural sweetener instead of refined sugar. Perfect for vegans or anyone else who avoids refined sugar. 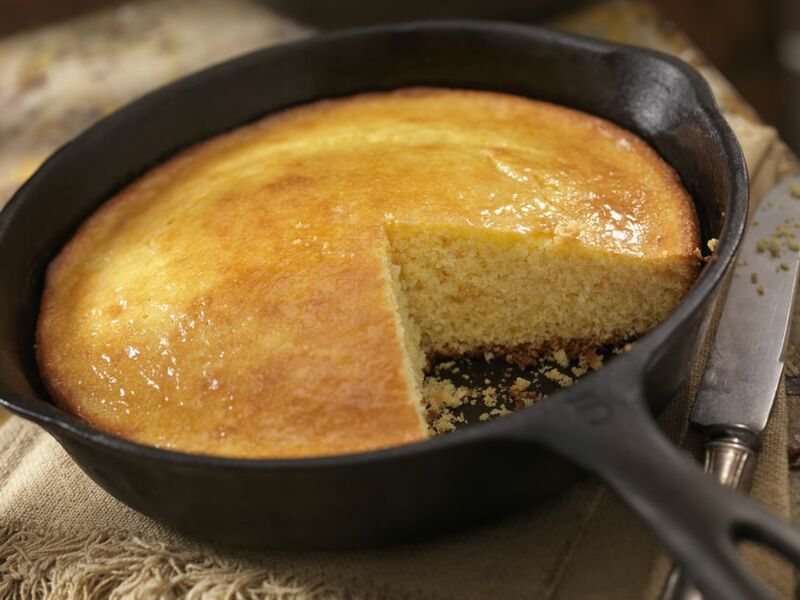 Skillet cornbread is the perfect accompaniment to a complete meatless Southern meal. Start with some Southern fried seitan "chicken", add some collard greens and, along with this homemade cornbread, you're in just about set for a completely vegetarian and vegan Southern-themed meal! And for a Southern dessert? How about this vegan chocolate rum pie or just a nice comforting homemade vegan bread pudding. Enjoy! Pre-heat the oven to 375 F. Lightly grease a 10-inch cast iron skillet and then place it in the oven to heat it up. In a small bowl, stir together the soy milk and lemon juice. In a separate large mixing bowl, combine the flour, cornmeal, baking powder, salt, and diced jalapeño peppers. Set this large bowl aside. In a food processor or blender, purée the corn kernels with the vegetable oil and maple syrup until smooth, creamy and well combined. Add the soy milk and lemon juice mixture to the blended corn and oil mixture and combine well. Next, slowly add to the flour mixture, stirring just until combined. Remove the cast iron skillet from the oven (don't forget - it'll be hot! Be careful when removing it from the oven and handling it). Add the vegan butter or margarine to the skillet, swirling it around to coat the skillet well, including the edges as much as possible to help it melt. This layer of vegan butter or margarine is what will give your homemade skillet cornbread its characteristic (and delicious) crispy bottom and edges. Once the vegan butter or margarine is fully melted all over the skillet, pour the prepared cornbread batter into the greased skillet. Return to the oven to bake for 25 minutes, or until lightly golden brown. Enjoy your homemade vegan skillet cornbread!